In the never ending pursuit of tomorrow's cutting edge mobile computing, the territory has been well populated. This includes the durable Toshibas, the constantly evolving, technological innovative IBM Thinkpads, ultra-lights, handheld PDAs and soon wearable systems. The future looks bright with new innovative and exciting products when manufacturers sharply focus on end user needs. This includes convenient form factors, efficient price-performance, wireless communications capability and new designs which help make our technologically influenced lives easier and saner. So why talk about a four year old sub-notebook computer? It's simple. I want to give a some quick, practical information, from a user perspective, of how my laptop performed over time. 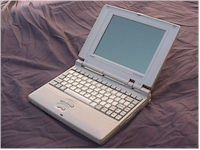 I bought my Toshiba Portege T3600CT in 1994. With a brilliant active matrix color screen, running at 50Mhz and a 500MB hard drive, this four pound unit is about 8 x 10 x 1.5 inches in size. Although it was quite expensive, in the $5,000 range when road outfitted, the price fell to the two to three thousand dollar price level, in about a year. All the computing publications I read gave the unit outstanding marks. Now after nearly four years of use, I still agree with these original reviews. MY real world experience has been great. Reliability has been downright perfect and I haven't had any problems worth noting. It still uses the original Lithium-ion battery, which still delivers an incredible four to seven hours of use. This is remarkable. The form factor of this unit is only slightly larger and heavier than most of today's ultra-notebooks. Aesthetically, it has aged quite well and looks very modern. The keyboard still has excellent feel. Unfortunately, for my typing needs, I need speech recognition. Data storage has been sufficient, but as software bloat continues, I plan to expand with either a new internal drive or an external removable hard drive. This unit has 24MB of RAM and runs like a Pentium on my word processing and presentation requirements, but with a LOT more battery life. If the CPU could be cost effectively upgraded to enable speech recognition, this unit could easily remain very satisfying, well into the next century. I feel that software usability has improved since I installed Windows 95, but I have elected to retain earlier, smaller and more efficient office applications. From an end user's perspective, I hope operating systems and applications will be improved to make things easier and more stable, instead of simply piling on more features that I will probably never use. Then perfectly good computers, like the Protege, would appreciate more efficient software, as well as their owners. The cost of ownership was low and return on investment was high, as time progresses. I had no repair needs or hassles. I would highly recommend this laptop computer.